This post will demonstrate how to create a right-click action on the Monitoring->Distribution Status->Content Status tab to send content to a DP group. Sometimes when troubleshooting an issue, I realize that the content was sent to one DP for testing, and then promoted to production. The out-of-box experience requires you navigate back to the object (package, software update, application, etc) and then send content to DPs. This right-click tool will save you several clicks. After selecting to “Send to DP Group”, you will see a PowerShell window with a prompt to choose the desired DP Group. Of course, you could create multiple right-click items with hard coded DP Groups and actions, but for this post, we’ll use the dynamic selector shown above. You can download the .zip file and follow the directions in the included ‘info.txt’ file for a fast deployment to your admin console. You can review additional details below. First you must create the proper r-click context menu. Copy the following .xml, save it as “SendToDPGroup.xml”, and copy it to C:\Program Files (x86)\Microsoft Configuration Manager\AdminConsole\XmlStorage\Extensions\Actions\14214306-59f0-46cf-b453-a649f2a249e1\SendToDPGroup.xml. (Adjust the path as appropriate to your ConfigMgr Admin Console installation path). -ExecutionPolicy RemoteSigned -File C:\PowerShell\CM12RClickTools\SendToDPGroup.ps1 "##SUB:__Server##" "##SUB:__Namespace##" "##SUB:PackageID##" "##SUB:ObjectTypeID##" "##SUB:SoftwareName##"
$DPgroup = read-host "Select a DP group, by number and press [enter]"
"DP Group Targeted distributed-Use the Monitoring node to monitor DP status." 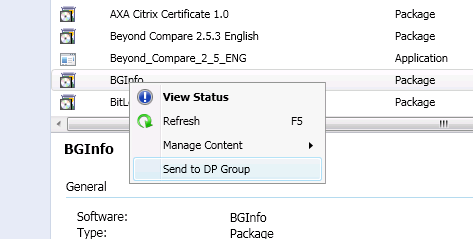 Now re-launch your ConfigMgr Admin console to use the new r-click->Send to DP Group feature. As you can see from the code, we use Get-CMDistributionPointGroup to obtain all DP groups, and then create a hash table to allow us to display a simple selector. We then use Start-CMContentDistribution to send the content to the desired DP Group. Notice the required argument is based on the object type (package, application, updates deployment package, etc. ), so we use a simple switch statement to determine the appropriate parameters to run.